Every stage of the manufacturing process is controlled and monitored by computer, with intensive computer control in deposition of the thin magnetic film. Eikon has chosen electrolytic plating because of its technical superiority, proven capabilities, and flexibility: magnetic characteristics are easily varied to meet customer specifications. 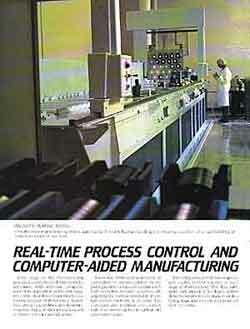 Eikon has dedicated a network of computers to process control. In the plating rooms, computers sample each bath every few minutes, automatically adjusting the bath as needed to maintain correct chemistry at all times. The computer also monitors and controls bath environmental factors such as pH and temperature. The computer control system generates quality control statistics at each stage of manufacture. This data summary and analytical feedback system detects changes in yield at any manufacturing stage and ensures processes are kept in control. Virtually every manufacturing step is automated. The only human handling is in moving cassettes; all actual handling of disks is by robot or machine.